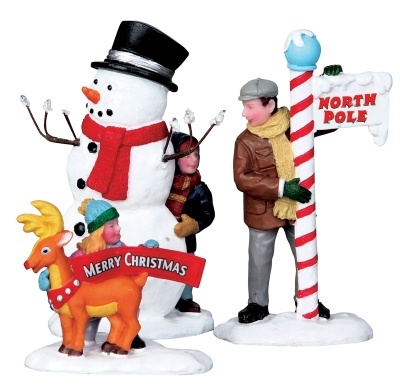 Lemax Setting Up For The Season Figurines Set of 3 depicts a winter scene of a Father with Son and Daughter out in the snow putting in place their outdoor street Christmas decorations for the community to see! Lemax Santa's Wonderland Village themed figurine set which joined the Lemax collection in 2010. Comprises multiple individual hand painted polyresin figures on three individual snowed bases to compliment your seasonal Lemax Village Christmas display.